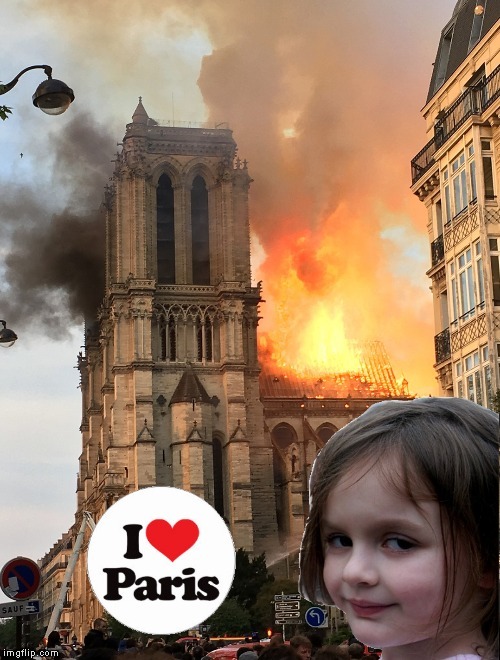 The Notre Dame Cathedral in Paris is on fire. 13th Century landmark in Paris. The frame of the building is done. Lots of priceless artworks in the building. Dafuq?! Is that the reason why it caught fire? That contractor company -- along with their insurance co. -- is gonna go bankrupt. They where doing 150 million in work. It had been going on for years. The cause is not know but it looks like it had something to do with construction. My Katimavik group happened to have a placement in Lunenburg not long after North America's second oldest Anglican church (1754) burned down in 2001. Numerous small fires were set all over Lunenburg over Halloween night. Whether it was kids or not, the town seemed to have a real distrust of young people. Our group volunteered to take part in the clean up. It was sad cleaning up all the broken stained glass and charred handcrafted wood that was once so beautiful. At the end of it I managed to get an old nail (more wedge shaped than a modern nail) out of it. It was eventually restored, but to see it in a more original form, it played a big role in the movie Simon Birch. I grew up without religion but I can appreciate some of the amazing works of art it inspire. Sad day. April 15 is a bad day yo. Titanic sank on april 15, boston bombing, and now this. Imagine living in the middle ages when the Cathedral was more than just an incredible piece of history. Back when it was the most important around. Its hard to imagine living at certain times in history, but standing in front of places like this Cathedral, or in the square in montreal looking at their notre dame basilica from only 200 years ago, you can at least get an idea what the area was like. These buildings are 800 years old, and are still by today's standards, incredible, even surrounded by 100 story sky scrapers and all of the other construction of the last century. Imagine what they must have been like when there were no grander buildings. And everyone around was devoutly religious. When this building might have been the most important thing in the world you know, before internet, and before anyone traveled more than a few dozen miles. Man, what a time that would have been. We don't really get any of that around here. Most of BC and Canadian history aside from a bit of Quebec and Montreal are all very modern. You can imagine standing at any point in Vancouver, because it was only a few generations ago that someone did, and they weren't that much different than us. We don't get to stand somewhere and imagine what it must have been like way way way way back then. No Muslims were involved, keep calm and carry on. Talk has it the person behind it was a white christian. We need a christian ban right now!!! Given the history of abuse within the Catholic Church, I could see it being a victim of that abuse. Or a nutjob. Or one of those people responsible for vandalizing churches recently for whatever reason. Or one of those self-hating whites who wants to end western society. Or a Muslim for the same reason. Or maybe it really was just an accident. What I find suspect is the media's quick assertion that the fire was an accidental blaze caused by construction work, all while the fire was still raging on. Anyone even questioning that narrative in the slightest has since been deemed a conspiracy theorists. It all seems like they are trying to push a narrative rather than find the truth - something they have been doing with increasing frequency and is why polls have shown a great distrust of the media. They are supposed to be ones asking questions.